“Almost 2 years ago, I decided it was time for a career change, and I started selling cars. My 2 year anniversary in sales is coming up next month and this has been a great career change from the mental health care industry where I was only earning $27,000 per year. I knew the car business wasn’t known for giving buyers the greatest experience and my goal from the beginning was to change that with my customers. 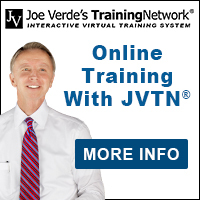 I was lucky to go to work in a dealership that provided Joe’s online training (JVTN®) because everything Joe and his trainers teach is customer friendly, and step by step process that works and allows me to treat all of my customers with respect and honesty. 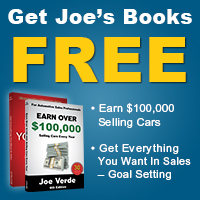 I learned Joe’s process, I control the sale and make sure I follow all of Joe’s steps, especially the demo and presentation the way he teaches it and that makes selling easy, and I get to make my customers happy! I average about 15 cars a month and at the end of my first full year I made $70,000. I’ve gotten 6 ‘Salesperson of the Month’ plaques, and I consistently get #1 on customer surveys.